LAS CRUCES, N.M. (June 25) - The New Mexico State athletics department proudly announced Wednesday that the Aggies were among the leaders in the Western Athletic Conference last year with 190 Academic All-WAC team members, finishing second overall for the 2012-13 academic school year. NM State’s 190 honorees surpassed the number of 2011-12 honorees. This total encompasses freshmen, transfers and returning student-athletes at NM State for the 2012-13 season. All-WAC recipients must carry at least a 3.0 grade point average and participate in at least 50 percent of the team's contests to qualify for recognition. New Mexico State earned 59 All-WAC Academic honors in the fall 2012 and 46 All-WAC Academic selections in the spring 2013. The Aggies also garnered 37 awards in winter 2013 to raise the total to 142 returning athletes recognized by the conference. Aggie freshmen and first-year transfers totaled 48 honors on the year with 13 in the fall 2012, 12 in the winter 2013 along with 23 accolades in the spring 2013. After exhausting their eligibility, Aggie student-athletes graduate on a more frequent basis than the general NM State student population at a rate of 70 percent. Over the past year, 77 Aggies received their diplomas. At the end of 2012-13, 15 Aggies maintained a perfect 4.0 GPA. Additionally, 55 student-athletes completed the spring semester with a 4.0 GPA after 34 Aggies finished the fall semester in the same manner. Last season 112 student-athletes were recognized at the El Paso Electric Crimson and White Society Banquet for earning or maintaining a 3.5 GPA or higher during the course of the academic year. Another 324 Aggies earned a 3.0 GPA between spring 2012 and fall 2012 and were honored at halftime of a men's basketball game on Wells Fargo Academic Night. In spring 2013, Aggie softball player Amber Olive earned First Team Academic All-America honors from CoSIDA (College Sports Information Directors of America). The cumulative GPA for all of the Aggie athletic teams combined remained above a 3.0 for the past eight years / 16 consecutive semesters. During the same period, scholar student-athlete representation has been higher than 50 percent of the student-athlete population. Moreover, the combined GPA from Aggie athletic teams topped 3.0 in 15 of the last 16 semesters. In addition to all of their athletic and academic success, NM State student-athletes compiled over 5,000 hours of community service during the 2012-13 academic year. The Aggies begin the 2013-14 season in August with women's soccer and volleyball matches leading up to Labor Day weekend when the football and cross country teams begin competition. 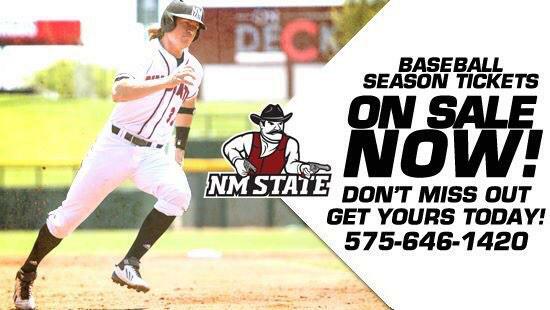 For all of the latest Aggie sports news, click NMStateSports.com.